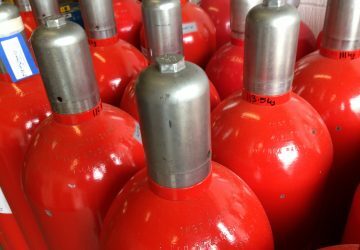 All compressed gas cylinders have to be hydrostatically tested every 10 years to ensure they are safe and fit for purpose. 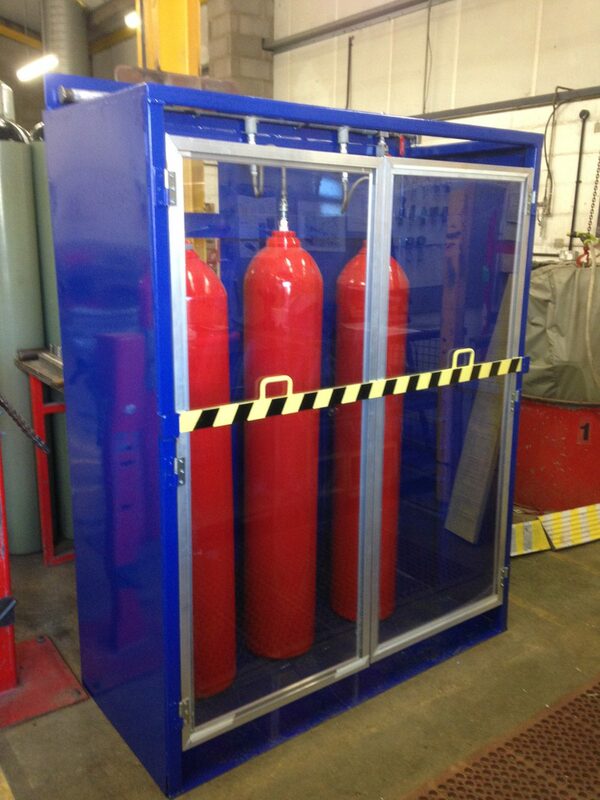 Flameskill have in-house test facilities to enable us to carry out cylinder testing. 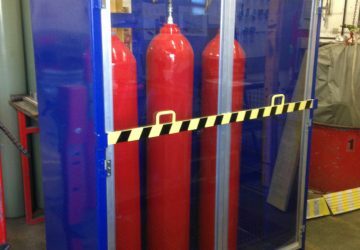 We hydrostatically test and maintain fire suppression cylinders, liferaft cylinders and BA cylinders to both British BS (UKAS 17020 approved) and American DOT standard. 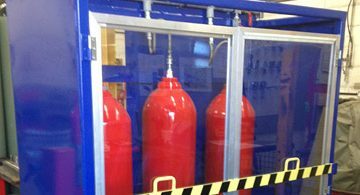 Hydrostatic testing involves the cylinder being filled with water and placed inside a water-filled high pressure chamber. Water pressure inside the cylinder is increased (166% of maximum working pressure) causing the cylinder to expand slightly. This in turn displaces a small amount of water from within chamber, which is collected and measured. If the cylinder expansion is within regulation limits (< 5%), then the cylinder has passed and can be certified fit for purpose. Compliant cylinders are dried out, stamped as tested with the current month and year, refilled with the appropriate suppression agent and placed back in service. Failed cylinders must be destroyed. This is a legal requirement to be able to test and inspect cylinders under the Transportable Pressure Equipment Directive (TPED). The Secretary of State for Transport, who is the competent authority for Great Britain, has set up an appointment scheme for the conformity assessment and inspection bodies in order to meet these obligations. 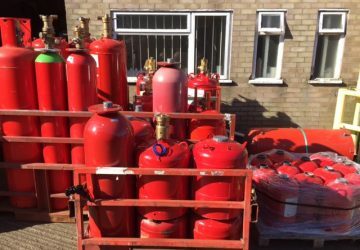 The scheme, which is operated by the VCA DGO Dangerous Goods Office, applies to a number of factors, which also includes “periodic or intermediate examination and testing of tank and transportable pressure equipment”. Companies or individuals carrying out these tasks MUST be accredited to EN ISO 17020, which is carried out by United Kingdom Accreditation Service (UKAS). D.O.T. approved test facility for cylinder requalification (DOT certified). This is a requirement for testing American Cylinders. 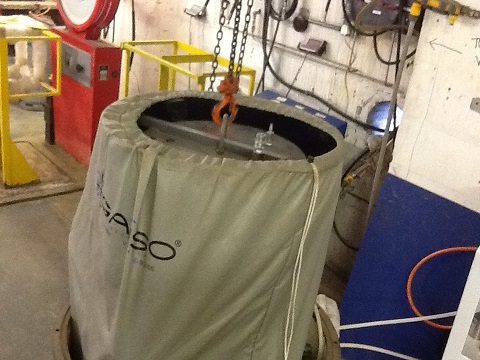 DOT cylinder testing, is also referred to as 12 year cylinder test. 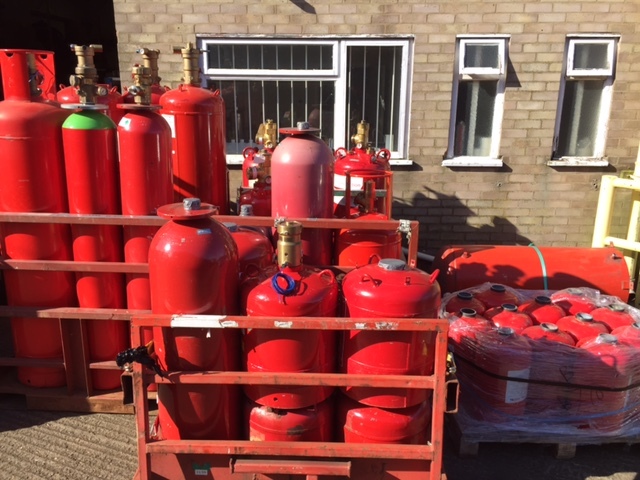 Flameskill also fully refurbish, and refill cylinders. Please see side menu. Hydrostatic cylinder testing can also be known as cylinder hydrotest, cylinder stretch test, 10-year cylinder test (12-year cylinder test for US Standard), cylinder pressure test, or cylinder requalification.